Comforters are thick, filled blankets that usually have a decorative design printed on them directly. They are meant to be placed over bed linens. 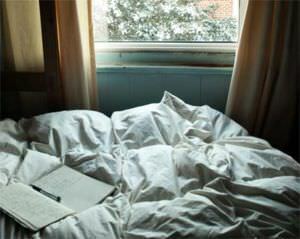 Duvets tend to be plain white and more thickly filled. They are intended to either replace a regular comforter altogether or to be an extra cover on top of a regular comforter. Removable and washable duvet covers can be purchased to add decoration to plain duvets and protect them from dirt. Bedding that is placed atop bedsheets and sometimes atop other thin covers. Bedding that, depending on its filling, may be placed on top of a comforter or replace the comforter altogether. Can be washed, but regular washing may lead to fabric pilling of the comforter's design/decorations. Filling should not be washed. Duvet covers are sold separately and can be washed or replaced. 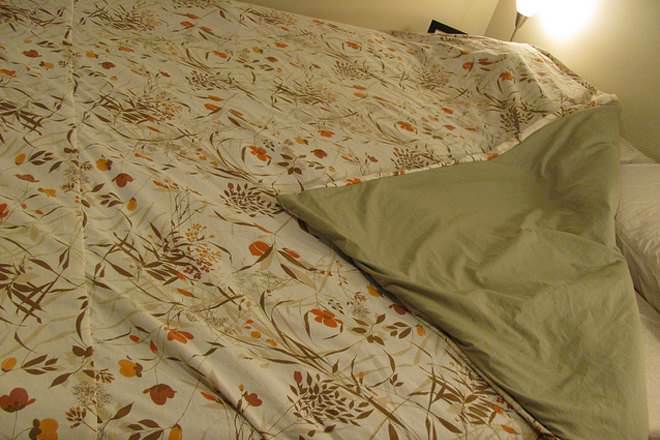 An example of a designer comforter. Both comforters and duvets are used to keep warm. What they are called and how they are placed on a bed, exactly, varies by region. In the U.S., a comforter is placed atop bedsheets and sometimes atop other thin covers (e.g., an electric blanket, quilt, or a bedspread, which is a very thin blanket). Depending on its filling, a duvet may be placed on top of this comforter or replace the comforter altogether. With their decorative designs usually stitched right on them, comforters often stay on a bed year-round. Down-filled duvets or down comforters, however, are usually only brought out for exceedingly cold weather when more warmth is needed. Down is ideal for wintry conditions, as it is a good insulator. The word "duvet" was originally and specifically associated with down feathers. (In French, "duvet" literally means "down," as in bird plumage.) In contrast, comforters were typically filled with other natural fibers, like cotton, or synthetic fibers, like polyester. Today, both comforters and duvets are often filled with synthetic fibers, but it is also easy to find either cover with a natural filling, such as down, wool, or silk. In most cases, duvets are a little more thickly filled than comforters. The filling of both is often stitched in such a way that it will not move and clump together in one portion of the blanket, but will instead remain evenly distributed. Down-filled duvets, which are often called down comforters, are typically filled with goose feathers, but it is possible to find duck down and bedding that uses a mixed variety of bird feathers. Comforters come in typical bed sizes: single/twin, double/full, queen, king and California king. Usually they are a little larger, so that they drape over the sides of a bed. In contrast, duvets and down comforters tend to fit to or near the dimensions of standard-sized mattresses for a snug cover. A duvet without a cover. Most comforters do not have a natural filling that is difficult to wash, and so most are made to be put directly into a washing machine. This means the entire comforter must be washed, rather than simply a cover. This is especially true of comforters from bed-in-a-bag sets. Large queen- or king-sized comforters are best washed in a large washing machine, like one found at a laundromat. Depending on their filling, duvets may or may not be washed in a washing machine. Those with a natural filling, like the down feathers in a down comforter, should not be put in a washing machine. This is one good reason why a duvet cover should be purchased for a duvet. That way the cover itself can be removed and washed, just like a pillowcase, even if the duvet cannot be. This has the benefit of making covered duvets easier to wash than comforters and more versatile than in some ways, as the design can easily be changed with a new cover. In all cases, follow the washing instructions found on bedding tags. The cost of comforters and duvets varies considerably according to size, filling, and design. Many comforters will be cheaper than duvets, however, and may be sold in bed-in-a-bag sets. In other countries, like Norway, a duvet (usually with a cover) replaces a top bedsheet altogether; moreover, couples usually have two small duvets — one each — rather than a duvet large enough to cover both people. Some countries have other terms for comforters. In Australia, it is common for a comforter to be called a "doona," a term borrowed from Scandinavian languages' "dyne," which means "down" and refers to duvets. 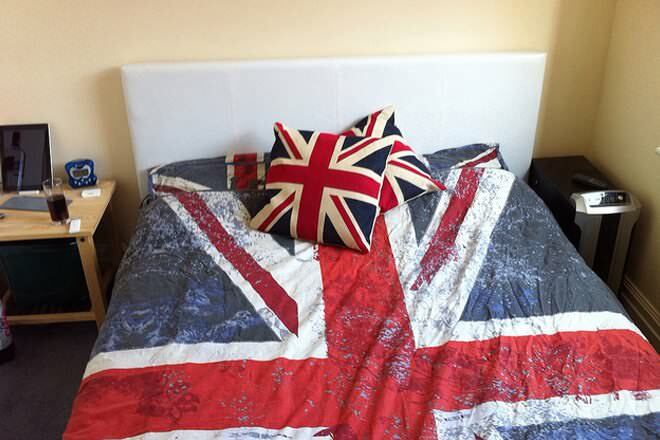 In British English, comforters may be known as "continental quilts." You still need sheets with a duvet, I don't know where the notion of not needing ''linens'' comes from? Lol and a slipcover for a duvet is a duvet cover, Comforters are generally use care and do not require ''covers''. If you buy a duvet some are machine washable but,you'll want to limit how often.Also many duvets are white so a cover to protect and be able to remove and wash easily is ideal. I reccomend a duvet as they are extremly comfortable. Cost range for a decent regular full sized one is approx $50-$120 well worth it if you can afford it. Also for those who suffer from allergies or are uncomfortable with the idea of real feathers, there are many synthetic feather options. I have always had comforters, growing up in a very low wage home i often got them from a goodwill or other charity store. Recently i have been shopping for some new bedding for my room and i've come across Duvet covers everywhere and very expensive duvets themselfs. I would love one they sound as if they are very comfy. Although one thing does bother me. I love having sheets and blankets( which you almost always need with a comforter for the fact they are more for warmth than actual comfort). I live in the south and as you could think it gets quite hot here even at night so i find it easier to just push my comforter to the side and sleep up just a sheet and in the winter cuddle under my comforter and stay nice in warm. Honestly i don't know if i could say which is better, duvets and duvet covers are very expensive but sound like a good product while comforters are cheep and easy but involve using sheets and blankets. To everyone's opinion which is the better product and why? The silly Americans who posted on 4-23-11 and 6-11-08 are way wrong. Duvet *is* comforter. It means "down" is French. Duvet cover is like a sack for the duvet, and is what you wash weekly. You *don't* use a top sheet or a blanket. Simple, extremely comfortable. Source: Almost all of Europe the U.K. In the UK and Europe, they do not use a top sheet generally and only use the duvet. They do use the fitted sheet on the bed. It is great!